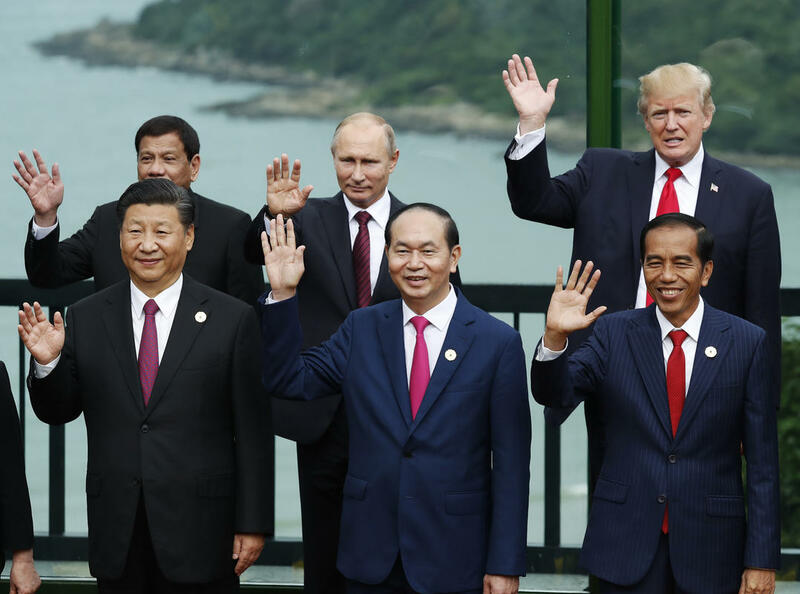 China's President Xi Jinping, Vietnam's President Tran Dai Quang, Indonesia's President Joko Widodo, Philippines' President Rodrigo Duterte, Russia's President Vladimir Putin, U.S. President Donald J. Trump pose during the APEC summit. Pool photo. Saakashvili was perhaps exaggerating the extent of the Russian aggression. But the war turned out to be a breaking point for pro-democracy movements around the globe. 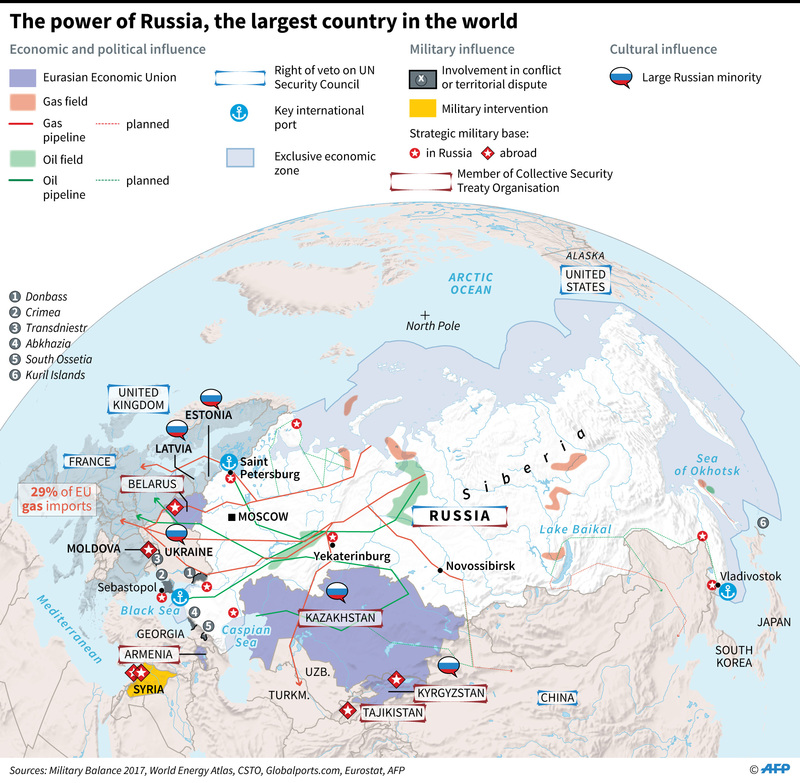 It proved to the world that Russia can blunt Georgia’s ambitions to join NATO, including through a military aggression and with complete impunity. The five-day war in the South Caucasus was the first breeze of a storm that would reverse democratic gains secured in the past three decades around the world. On the same day when Russia started the military campaign against Georgia, China put on display a spectacular show during the opening ceremony of Beijing Olympics, a depiction of its growing political and economic clout in the world. While China’s economy was booming exponentially, U.S. financial behemoth Lehman Brothers declared bankruptcy, setting off a bruising financial crisis that consumed the world for several years, particularly the Western liberal democracies. Skeptics of capitalism and the liberal world order felt vindicated. 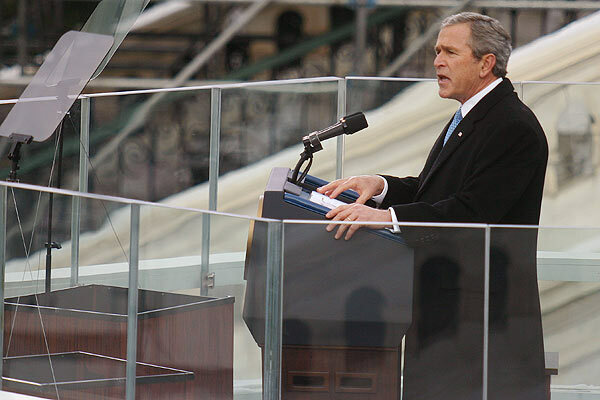 George W. Bush in his second inaugural address. These were President George W. Bush’s final months in office. The anti-war movement in the U.S., spearheaded by Senator Barack Obama, was picking up the momentum as part of his presidential campaign. Obama’s victory would mean pro-democratic forces around the world would lose crucial U.S. backing. Only four years before the Obama’s presidential victory, in his second inaugural address President Bush said: “By our efforts, we have lit a fire as well, a fire in the minds of men. It warms those who feel its power. It burns those who fight its progress. And one day this untamed fire of freedom will reach the darkest corners of our world.” The war he started in Iraq was supposed to open the gates of freedom for other nations in the Middle East. It turned out to be a disaster. Obama’s promise to end wars his predecessor waged was synonymous with a retreating America from the world. In Cairo, just a few months after he became the president, Obama ensured despotic Muslim leaders that they are safe from the U.S. Pro-democratic forces around the world were being left abandoned by the world’s most powerful democracy. Obama’s unwillingness to promote democracy as passionate as Bush did created an unfavorable international environment for pro-democracy groups. 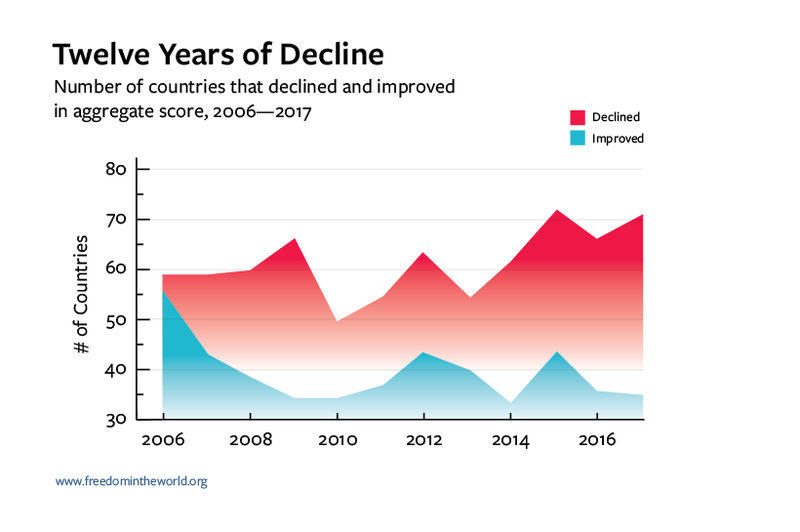 The economic success of authoritarian countries, U.S. retreat from the world and the resurgence of countries like Russia and China helped weaken the momentum of democratic progress. Democracy was in crisis. The Russian aggression in Georgia in 2008 was a starting point from which one nation after another chose a different path from liberal democracy. This reverse process of democratization has become the first wave of autocracy. Since then, there has been a visible loss of appetite for democracy in many nations. The record number of countries slid from some form of democracy into some form of autocracy. According to a recent survey, at least 22 percent of Americans prefer a strongman rule to a democracy. 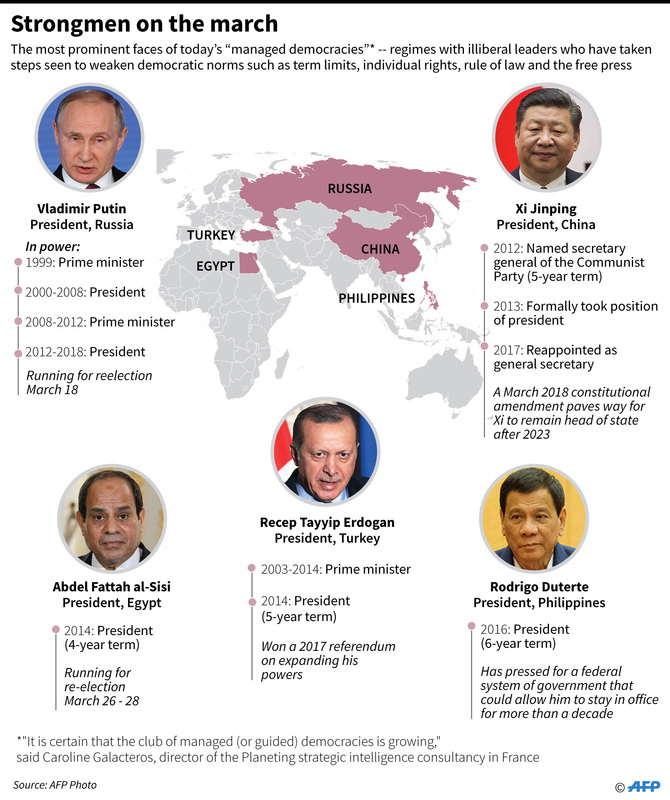 The 38-nation survey revealed that at least 26 percent of people in the world favor a strongman rule, a figure that can put a significant number of lawmakers in parliaments, impact coalition governments and influence policy-making. Seven-in-ten Vietnamese believe the military rule is a good way to govern. Strongman rule is preferred by 55 percent of people in India. Only 27 percent of people in Turkey expressed commitment to the representative democracy. Even in Spain, 17 percent are willing to consider non-democratic options and 40 percent are less committed to democracy. In 2005, President Bush used the word “freedom” 27 times in his second inaugural address. Obama used 3 times in 2009 and 7 times in 2013. In 2017, President Donald J. Trump didn’t mention this word. According to the Freedom House, democracy faced its most serious crisis in decades in 2017 as its basic tenets—including guarantees of free and fair elections, the rights of minorities, freedom of the press, and the rule of law—came under attack around the world. It said 71 countries suffered net declines in political rights and civil liberties, with only 35 registering gains — the 12th consecutive year of decline in global freedom. 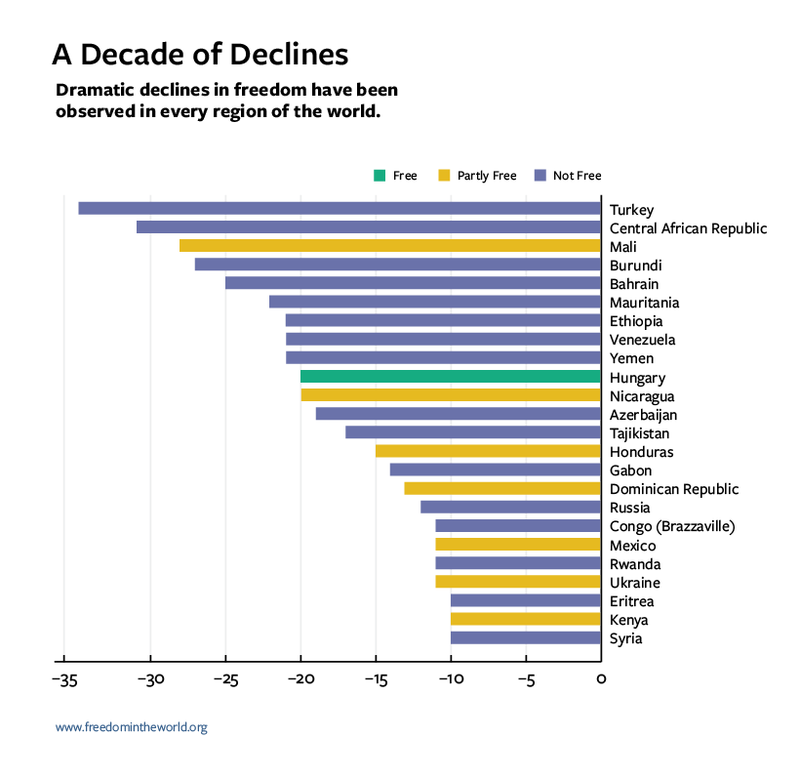 Over the period since the 12-year global slide began in 2006, Freedom House reported, 113 countries have seen a net decline, and only 62 have experienced a net improvement. President Trump’s 2019 budget request proposed nearly 40 percent cut to the fundıng for democracy programs. Freedom House said the cuts to democracy assistance funds would harm the U.S. and global security. The chaotic collapse of the Soviet Union in 1991 was an ideological triumph of democracy. For the first time in history, most nations on Earth embraced democracy as the best form of governance. Even authoritarian leaders enshrined democracy as a guiding principle in their countries’ laws — if not in practice. Most post-Soviet countries, some of which experienced a short period of democratic openness, stagnated in their transition to democracy. Economic and political turbulence following the chaotic collapse of the Soviet Union laid bare limitations of democratic governance, with large segments of the society blaming democracy for their failure. Post-communist countries in eastern Europe, however, viewed democracy and open borders as the only pathway to prosperity and modernization. Their successful transition from communism to democracy was a textbook example until populist governments put democratic progress in serious danger. Hungary and Poland, both members of the European Union, are increasingly endorsing measures to threaten the media, tightening the government control over courts and undermining the civil society. In the Middle East, authoritarian governments were challenged as a result of so-called Arab Spring upheavals. Quick collapse of the authoritarian regime in Tunisia and spiraling protests in Egypt heralded a new wave of freedom sweeping across the region. The world was convinced that the tide was unstoppable, prompting Western countries to back revolutionary forces in Egypt, Libya, Yemen, and Syria. Mass uprisings in 2011 were touted as a Middle East version of 1989-90 revolutions in Eastern Europe. It was a false comparison, primarily because communist regimes in Eastern Europe were propped up by the Soviet Union. The Soviets crushed any pro-democracy uprisings for decades such as the one in Budapest (1957) and Prague (1968). When the Soviet Union was no longer capable of preserving these communist regimes, they fell like dominoes. In the Middle East, however, the fall of the Tunisian regime sent other autocrats to immediately take anti-revolutionary measures. 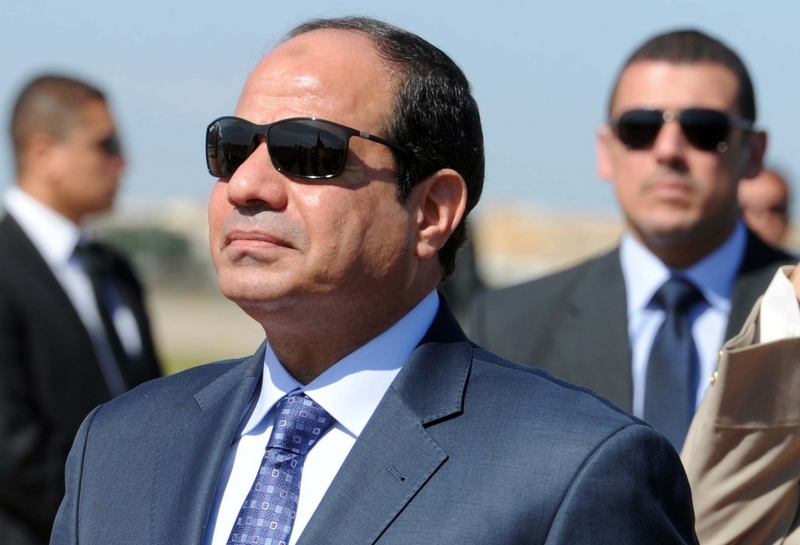 In Egypt, wary of the international pressure, the military replaced President Hosni Mubarak with its own tyrannical rule and then put Abdel Fattah el-Sisi at the helm of the government. Six years into the 2011 revolution, freedoms in Egypt are so limited that it is even worse than it was during the Mubarak’s era. 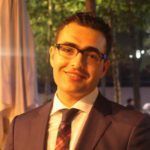 In Libya and Syria, where the opposition did not have the necessary power to topple their governments, Western countries intervened in various forms, paving the way for years-long bloody civil wars. “Democracy” doesn’t have the same meaning in everybody’s vocabulary. For different people, the concept of democracy is shaped by historical and political circumstances. The lack of understanding of democracy has also been a major factor in the lack of democratic progress. For people who had been alienated or discriminated as a class, race, religious or a social group before the advent of a democratic rule, democracy often means self-rule and freedom. They usually fight for the emancipation and empowerment of their group rather than individual liberties. When they seize power, they usually establish a tyranny of majority. The rule of law becomes the rule by people. On the other hand, for people who have shared grievances such as violation of personal rights and freedoms, democracy means upholding individual liberties, minority rights and accountability of the ruler. Western democracies are founded on these premises. This is precisely the biggest reason why secular movements are more successful in building liberal democracies than Islamist groups. In some countries (like Turkey and France) where secularism has become an ideology rather than the separation of church and the state, it had the opposite effect. The state in these countries has been exploiting secularism to crack down on opponents harboring religious views. Throughout the history, democratic openness usually led to economic prosperity (South Korea after the 1970s), reinforcing a dominant belief that more democracy means economic welfare. Without stability or functioning institutions, however, democratic openness usually led to an economic downturn and more poverty. Nations that experienced this type of financial turmoil following the introduction of liberal governance are blaming democracy for their economic woes. While a desire to be free is the biggest driving force in pro-democracy movements, economic inferiority and inequality are also significant factors in mobilizing masses against autocrats. But the rise of countries like China and Russia as economic powerhouses, both authoritarian, debunked this notion. 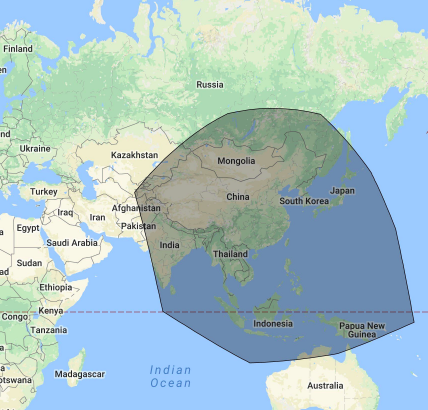 China has become an alternative credit-lender to poor and non-democratic countries in Asia and Africa, without demanding structural reforms that have been a condition for the aid provided by IMF or the World Bank. The era in which democracy was considered as the dominant ideology has gone. Stable countries with thriving economies and strongmen as rulers is the new prevailing trend. Turkey, Russia, and China are cited as successful economic examples to be followed. Resurging Russia and China also create an unfavorable international environment for pro-democracy groups. These nations are making sure to reverse pro-Western democracy movements in their own backyard. From Syria to North Korea, Russia and China have been key in keeping autocratic regimes intact. Russia continues undermining democracy as far as in the U.S. and Western Europe through incessant information warfare. The election of Trump in the world’s most powerful democracy threw a spotlight on his agenda. Trump’s heated rhetoric during the electoral campaign brought a renewed vigor to groups that have since been on the fringe. This week, 10,000 neo-Nazis marched on the streets of Warsaw, a remarkable development in a country that is still reeling from the horrors of the Holocaust. President Trump’s ideas of economic nationalism, and taking power back from the establishment were populist slogans that reverberated well all around the world. His stunning victory in 2016 emboldened right-wing populists elsewhere. Right-wing parties, with disturbing racist agendas, fared well in elections in France, Germany, and the Netherlands. The election of Narendra Modi in India put the world’s most populous democracy into a dangerous trajectory. Turkey suffered a significant setback in democratic governance and lost its title as a role model for other Muslim countries. In the Philippines, Rodrigo Duterte’s approval rating remains high despite his murderous campaign against drugs. Mikheil Saakashvili, former President of Georgia, is living in Brooklyn, NY. Photo: NY Times. Rapid globalization put many communities at a disadvantage, and populist leaders skilfully tapped on their anger through racially-tinged campaigns and nationalist slogans. These communities put the blame squarely at core tenets of democracy — openness, liberalism, and pluralism. No wonder right-wing movements designated irregular immigration as the primary culprit. The upsurge of populist leaders around the world, the rise of authoritarian China and Russia as leading examples for many developing nations, and the lack of understanding of democracy have taken a toll on democratic progress. And the outcome is the current wave of autocracy sweeping across the globe. 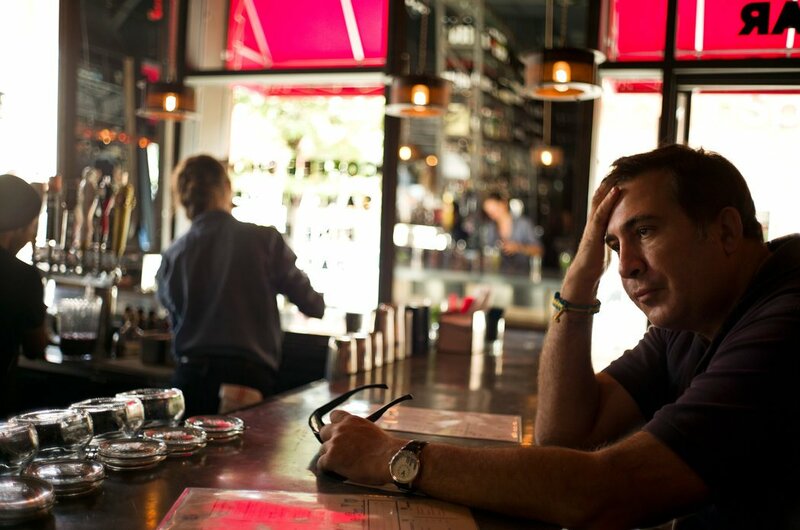 Saakashvili, once an icon of color revolutions, is now a stateless man with a stifled voice. So are many pro-democracy movements.